Athenafilm was founded in 1983. It has produced six (two fiction, four docs) feature length films released in theatres and some 60 shorter films and programmes for tv. Athenafilm has also been involved in three (one fiction, two docs) feature length international coproductions produced by companies abroad, mainly the Nordic countries. We have been active as production consultants in another four theatrically released documentaries. During the last 12 years Athenafilm has produced five longer documentaries made by the renowned Swedish director Jan Troell, most of which have been shown at prestigeous international film festivals. We work with fiction films as well as docs – but we often specialize in art, history and politics. Göran Gunér was born in 1943. After academic studies he passed the producer´s training at the National Filmschool 1967-69. He worked as production manager and producer for the Swedish Filminstitute, Swedish TV and independent production companies 1969-82. In 1981 he co-wrote and directed a one hour drama for Childrens dpt Swedish Television, Johan is dead, chosen best film for children in Sweden that year. In 1983 Gunér set up his production company Athenafilm. He has written and directed some 60 films and tv-programmes 1983 – 2010. Parallel to this he has been active as producer. 1994-95 he was selected for and participated in EAVE, a Media programme aimed at European producers. From 1992 to 2006 Göran Gunér was also active as trainer on part time level for the National Film School, then being responsible, among others, for organizing seminars and short courses for professionals in the documentary area. What is it that attracts some of us to old buildings and objects? Why do some spend so much effort and money on preserving them? I first met Lars Sjöberg in 1986. Since then, we’ve worked together on books and articles and two exhibitions in Paris. The latest book is about Lars himself and his nine houses and a church. Do buildings we’re attracted to reflect the state of our souls? Is there a form of security in a slumbering past? Lars Sjöberg goes against the stream, claiming he’s not a Romantic. Is he a visionary, then, inspiring us with knowledge of the past in striving for a more sustainable future? It might be said, philosophically speaking, that peoples who haven’t been allowed to retain traditions are more prone to mental suffering, confronted with the modern. Unless the modern stems from their own background, from their own tangible environment. Buildings, as such, consolidate one’s thoughts –one’s feelings of where one belongs. But I have this belief that beauty can be appreciated by all of us if we’re allowed to see it often enough. In some way, I believe, that we people have a built-in compass to beauty. Produced by Göran Gunér/Athenafilm for the Ljusår (“Lightyears”) project at Stockholm City Museum. Editing and technical production by Inu Enescu. A different age’s light means a different life. In Out of the Dark, lady of the manor Märta Helena Reenstierna, the most renowned Swedish diary keeper of the early nineteenth century, is a witness of that age, as are her contemporaries, the painters Pehr Hilleström, Alexander Lauréus and Kilian Zoll. They tell us, in pictures and words, what life was like before the existence of the paraffin or kerosene lamp and electric lighting. In their age, darkness prevailed over light, even when lighting was lit. Today, those conditions are hard for us to conceive; but, to those who lived then, they comprised a reality that all had to contend with. The film Out of the Dark is a journey of discovery into the past. The open hearth and pine splint were the most usual forms of lighting throughout time, until the 1850s. From a sketchbook of Kilian Zoll’s, Kulturen i Lund. Photo by Inu Enescu. Do Something! You’ve Got To Do Something! A film about the author and champion of peace EDITA MORRIS (28 min, 2010), directed and produced by Göran Gunér. English narration and subtitling. Edita Morris’ life is fascinating and captivating. After her impoverished aristocratic upbringing in Östermalm, Stockholm, at the age of 20 she broke away and went off into the world, became increasingly radical and frequented leading European literary and artistic circles. She was drawn to the craft of writing through her husband Ira, as well as through their friend Bertolt Brecht. The Second World War, and in particular the Hiroshima atomic bomb, made her a committed campaigner for peace. Her son Ivan (who had studied Japanese at Harvard) had come to the devastated city as interpreter just a few days after the catastrophe. He was only 20 years old and described to Edita the terrible sights he had seen. His personal experience marked the beginning of her lifelong fight for peace and against nuclear arms – particularly evident in the book Flowers of Hiroshima, published in English in 1959, which has sold 3.5 million copies in all together 37 languages! The film is a chronicle of Edita Morris’ varied life with its contradictory facets, structured around private photographs and souvenirs of friends such as the publisher Gertrud Gidlund, the film and theatre director Suzanne Osten and her relative Professor Christopher Toll. The last 13 years of her life Edita was alone after the deaths of both her husband and son. She started to come back increasingly often to Sweden and her new friends Gertrud and Suzanne, a relationship which was founded on artistic cooperation. Through conversations with them and with Christopher Toll a vision emerged : To establish Edita and Ira Morris Hiroshima Foundation for Peace and Culture. Since 1990 the Fund has granted awards to women and men who have made major contributions in the cultural field towards peace and reconciliation. 2010 the English documentarist Kim Longinotto was honoured with the award of USD 100.000. (30 min, theatrical release 2000) Directed by Jan Troell in cooperation with Agneta Ulfsäter-Troell. Produced by Göran Gunér. English subtitles. Not unexpectedly Troell´s contribution to the group-project facing the new millenium -“Swedish stories” - is outstanding. Here the lives of ordinary people on the countryside on Sweden´s southern tip mirror, without effort, something more general. This time we encounter some enthusiasts running a small radio station. Singing, talking, and greeting is heard, listened to and exchanged.. The image of a technology serving people and their fellowship is developed together with the one of a society not having lost its soul. ---Troell is the great observer among Swedish documentarists. His brilliant cinematography and associative editing literally cuts out meaning and coherence from the visible reality. A tale from memories, letters, books etc. of the artist (47 min, 1986). Written, directed and produced by Göran Gunér. English and German narration. One of the best made and most straightforward programmes imaginable. Percy Brandt´s reading was so congenial, one wondered more than once if it was not the old man himself. (60 min 1997) directed by Jan Troell, written by Jan Troell and Göran Gunér, produced by Göran Gunér. English subtitles. A dream came true; the balloon “Eagle” leaves Danish Island, Spitzbergen 11th July 1897. Long live old Sweden! August Andrée and his crew had set up their goal, believed to be unattainable – they wanted to be the first to reach the North Pole. 33 years later the whole expedition was found on the remote White Island in the Polar sea. The remains disclosed a tragedy that took place three months after the ascent of the ballon. Both events were world news. A fascinating documentary narrative in images with resembling the classic tragedy. Troell has managed to achieve this in his new film Their Frozen Dream, where he again depicts the airborn Andrée-expedition. The story is told through the diaries of the crew, revealing their fateful march towards the death in the ice from day to day. With unswerving feeling for the lyrical and musical elements in some of the old photographs taken by the young crew member Nils Strindberg, Troell manages to let them depict the White Island tragedy. The last image is Strindberg´s camera. Like Horatio in Shakespeare´s eternal drama it is left behind, alone. (26 min, 1992) Written, directed and produced by Göran Gunér. Cinematography by Bengt Danneborn. Music: Michael Svernby.English subtitles. Axel Petersson was nicknamed “Döderhultarn” after his native place. For long he was considered a rural eccentric carving his wooden figures out of logs of wood in his mother´s kitchen. But his breakthrough came in Stockholm in 1909. The public was impressed, the critics raved, fellow artists and collectors started to buy from “Döderhultarn”. Orders for new works rolled in and during the next few years his figures were exhibited all over the world. He could now command substantial fees. Most of them were spent on his special indulgence – flying! The more daring the manoeuvres the better he liked it! This is a story of life and death told by an ingenious self-taught master, well aware about the mysteries of existence and able to express them. Jag skall bli Sveriges Rembrandt eller dö/I Want to be Sweden´s Rembrandt or Die! In the world of Swedish art, Ernst Josephson (1851-1906) is one of the really big names. During the last century and even today he has continued to inspire new generations of viewers and artists. This is especially true when you look at what he created during his 18 years of mental illness. Then his style changed and became dreamlike, free, but also marked by his suffering. To us these works both seem surprisingly modern and timeless. From contemporary letters and articles, reminiscences and poems reaches us as if its owner was still in the room. It whispers, rejoices, pleads, struggles, rages, sings, confesses. 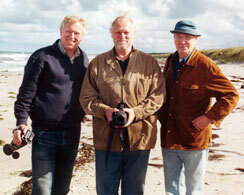 Göran Gunér´s very watchable film puts the work of the artist in focus. That is rarely the case on film. (30 min, 1996). Written, directed and produced by Göran Gunér. English narration. This is the story of a Swedish Utopia on the prairie founded by a religious sect in 1846. Led by their prophet Erik Janson some 800 Swedes emigrated to the US this year, which also marks the start of mass emigration from a poor country in the north. Soon the prophet was murdered in a court house, but the colony continued to prosper until the breakout of the Civil War in the early 1860s. Olof Krans, the painter of Bishop Hill (born in Sweden 1838, brought to Bishop Hill By his parents in 1850) recalled at old age his childhood memories and painted them with naïve charm. Through these images it is still possible to visualize this Utopia on the prairie. Bishop Hill is nowadays considered the most remarkable cultural monument outside Scandinavia. And Olof Krans is one of the most prominent names in American folk art. He has his own museum at Bishop Hill, Illinois, a few hours by car from Chicago. (84 min, theatrical release 2003) Directed by Jan Troell, produced by Göran Gunér English and Danish subtitles. Directed by Stig Holmqvist, produced by Göran Gunér. English narration and subtitles. His life and his death, his words and his actions, have done more to shape public expectations of the office, and indeed of the Organization, than those of any other man or woman in its history. His wisdom and his modesty, his unimpeachable integrity and single-minded devotion to duty, have set a standard for all servants of the international community – and especially, of course, for his successors – which is simply impossible to live up to. There can be no better rule of thumb for a Secretary –General, as he approaches each new challenge or crisis, than to ask himself, ”how would Hammar-skjöld have handled this? ”…What is clear is that his core ideas remain highly relevant in this new international context. The challenge for us is to see how they can be adapted to take account of it. The vision of a Secretary General portrays the legendary Secretary General of the UN, Dag Hammarskjöld (1905-1961). He died in a plane crash when trying to maintain peace in post-colonial Congo. This happened when the cold war was at its coldest. Hammarskjöld´s death marked the ending of a peace dream shared by millions all over the world. It was he who that had brought it to them. What Hammarskjöld until then had achieved with his integrity, idealism, intelligence and bright vision of a world in peace based on human rights and the UN charter can still be regarded as a guiding star for the United Nations. The need of a respected and efficient UN is today greater then ever before.Is Hammarskjöld´s vision and his legacy still valid in the beginning of this new century? Is there any space left for his idealism in today´s ruthless reality? Can the UN find a way to balance the influence and power of the only remaining player from cold war - the US? From lots of different sources, a thrilling archive footage, many new interviews the filmmakers have compiled a well working story, that gives us a convincing image of the Cold War era. At the same time you get close to Dag Hammarskjöld himself.